Home Health Visits May Help Keep People Out Of The ER : Shots - Health News Washington, D.C., is experimenting with providing home visits and telemedicine to people on Medicaid, with the goal of making it less likely they'll end up in the emergency room. Dr. Gita Agarwal of Mary's Center conducts a telemedicine conference with Dennis Dolman from his mother's house in Washington, D.C. In Washington, D.C., Mary's Center, a community health center, is piloting a program to provide primary care virtually to Medicaid patients who can't make it in to any of their clinics. Sometimes there are mobility or childcare issues, some people may not be able to get time off of work. Others simply don't want to go. Dennis Lebron Dolman was in the latter group. He went to a health screening fair over the summer, where Mary's Center medical assistant Grace Kelly took his blood pressure. It was dangerously high: 180 over 100 — stroke-level high. He had no idea it was that bad. Despite those scary numbers, he didn't want to go to a doctor and get treatment. 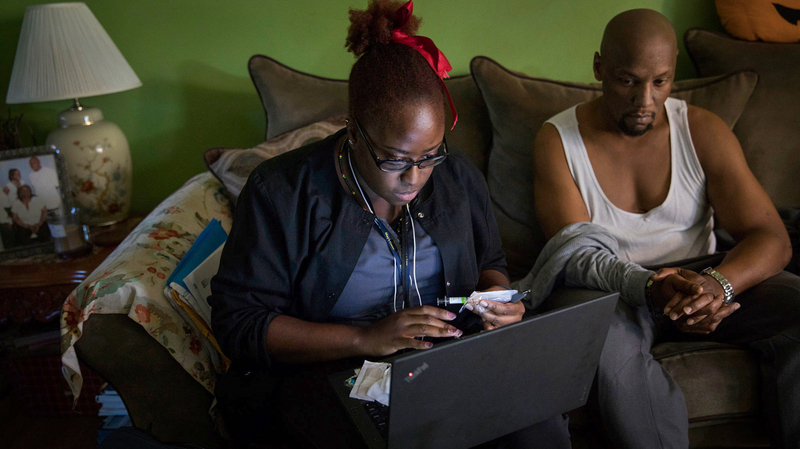 So Kelly, who was working at the health fair, talked him into an alternative: she would come to him, with a clinic in a suitcase (a scale, blood pressure monitor, virtual stethoscope), and a laptop to connect virtually with a doctor across town. 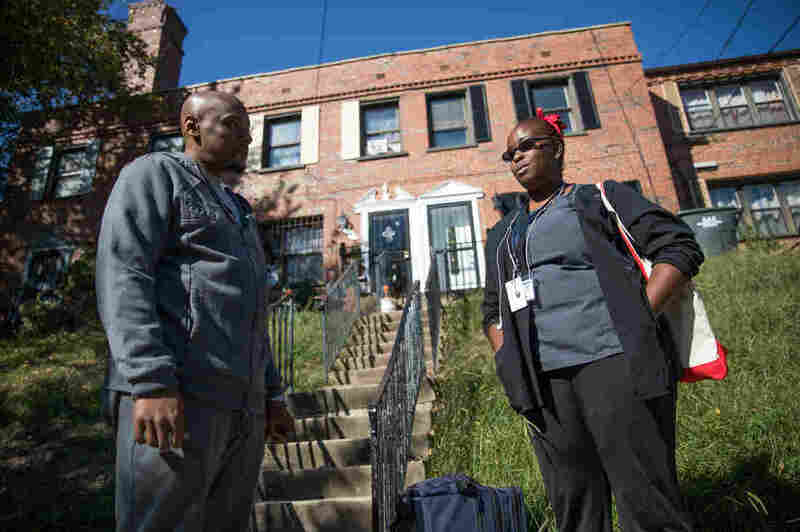 All of it is paid for by Trusted Health Plan, one of D.C. Medicaid's managed care organizations, which has partnered with Mary's Center to cover home visits like this one as part of the pilot program. On a fall afternoon three months later, Dolman, 41, sits next to Kelly on a cushy brown couch at his mom's house in Northeast D.C.
"So what I want you to do is listen to this while I take your blood pressure," she says. "Because I do not want it to be high." "OK," he says, leaning back. "As you breathe in, be aware of breathing in," the meditation lady croons from the app. "And as you breathe out..."
"It's a lot better than before, but it's still high," Kelly says. At the appointment, Kelly goes through all the things patients normally do at a doctor's office before the doctor comes in. She checks Dolman's weight, temperature and blood pressure. When it's time for the doctor to appear, the laptop starts ringing. 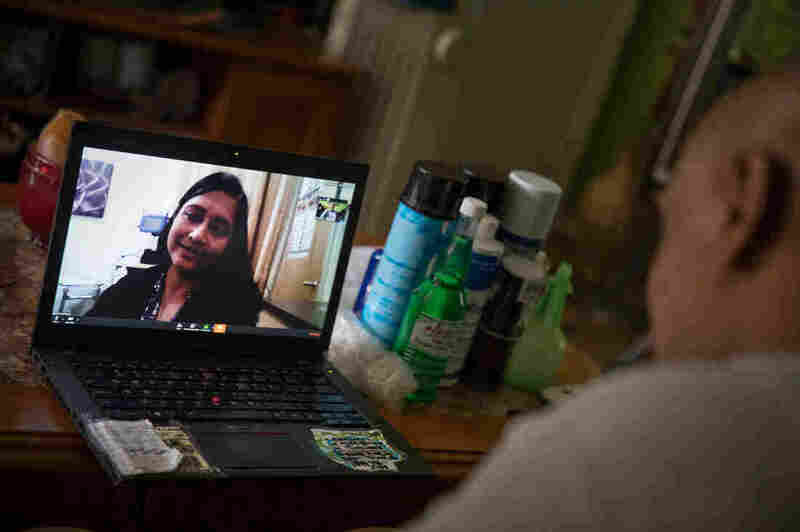 Dolman's doctor is Gita Agarwal, and at this moment, she's in an exam room at Mary's Center in the Adams Morgan neighborhood of Washington, sitting in front of her laptop camera. She can see Dolman and check out all the vitals that Kelly has just entered into his virtual chart. The blood pressure is not quite where she wants it, but she agrees to let him keep improving his diet and exercising to try to get it down, rather than taking medicine. He'd really rather not take anything. "Oh!" she shouts. "What happened with the weight?" "It might be clothes," Kelly suggests. Dolman is wearing sweats and thermals. "All nine pounds of it?" Agarwal asks. Dolman weighs 210, which isn't too bad for his height, but he had lost weight as part of a diet and exercise program to get his blood pressure down. Now it has crept back up. "I haven't made it to the gym yet. That's the problem," he says. Medical assistant Grace Kelly checks Dolman's vital signs before he talks to the doctor via teleconference. "What should we do, what do you think?" Agarwal asked. "Do you want to see a nutritionist?" He thinks about it. "That would be fine." "And how about an exercise program?" "It's still early days for telemedicine, but there are lots of reasons to believe that establishing the kind of relationship between a patient and provider and having that continuity of care will ultimately reduce some of the non-emergent visits to the E.R.," she says. That's key for D.C., which has the highest per capita 911 call volume in the country. Mary's Center pilot program grew out of AmeriHealth, a Medicaid managed care organization in D.C., approaching the health center and wanting to brainstorm how to get the District's unnecessary emergency visits down. Now, the program has expanded to Medicaid patients like Dolman who have Trusted Health Plan. "We're very supportive of the fact that our [managed care organization] partners are testing these innovations and looking at these pilots so we can have an understanding of what's really going to work for district residents," Holve says. Elsewhere, one of the big barriers to telemedicine has been working across state lines; the doctor has to be licensed in the same state as the patient. By working with local patients who would be eligible to come in to the clinic, Mary's Center sidesteps that problem. But the push for telemedicine in the District is about more than just reducing ER visits, Holve says. It's about improving the health of Medicaid patients in the long run. "That's really what we're banking on," she says. "That we'll measure improvement in quality of care and that we'll see an ability for our patients to get healthy and stay healthy." By the end of Dolman's telemedicine appointment, he has a meeting with a nutritionist in the works, Kelly has agreed to drop off a blood pressure monitor at his house later that day, and they set up a therapist appointment. "I've been nice to you, I didn't prick you again," Agarwal teases. Dolman isn't a fan of needles. On second thought: "How about the vaccine, did we give you the vaccine?" she says. "No, I'm fine," he says. She laughs, "No, really. Do you want a flu shot?" "I usually do fine without a flu shot," he says. "But how do you know you'll be fine this year?" She tells him how bad the flu can be, how sick she got one year. "That's what we're trying to prevent," she says. "What do you think?" He relents. Medical assistant Grace Kelly has a flu shot with her, and she gives it to Dolman on the spot, there in his mom's living room. "Dr. Gita's good — I like her," Dolman says. He walks Kelly out at the end of the visit while she waits for her car. And he likes the telemedicine program, it works for him. "It's convenient and good company, all of the above," he said. He likes feeling that someone's keeping track of him so he doesn't slack off. Someone who'll check to see if he has gone to the gym, improved his eating habits and — ultimately — get that blood pressure down. Selena Simmons-Duffin is a producer at NPR's All Things Considered, currently on a three-month staff exchange with Washington, D.C., member station WAMU, where she is reporting on health.